Show Us Your Scooter Quilts! Gitta in San Diego shared a photo of a quilt a friend made her after she sent her the link to the scooter quilt pattern we posted here. And her friend did the quilt in the colors of Gitta’s own chariot. I particularly love the button (or button hole?) headlight. Have you made your own quilts? Let’s see them! Send photos to tips AT scooterswag.com. 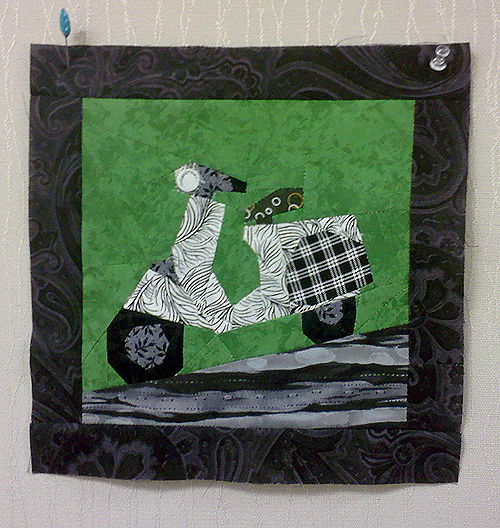 This entry was posted in Art, Crafts, Decor, Fabric and tagged Crafts, lambretta, quilt pattern, quilting, scooter, sewing, vespa by Tracy. Bookmark the permalink. Thanks for the feature, Tracy! The headlight is one skillfully placed bubble from the pattern on the fabric!